Perry's Ice Cream has just launched a dessert that everyone can enjoy! The dairy-free, oat-milk based frozen dessert features seven flavors available in pints. 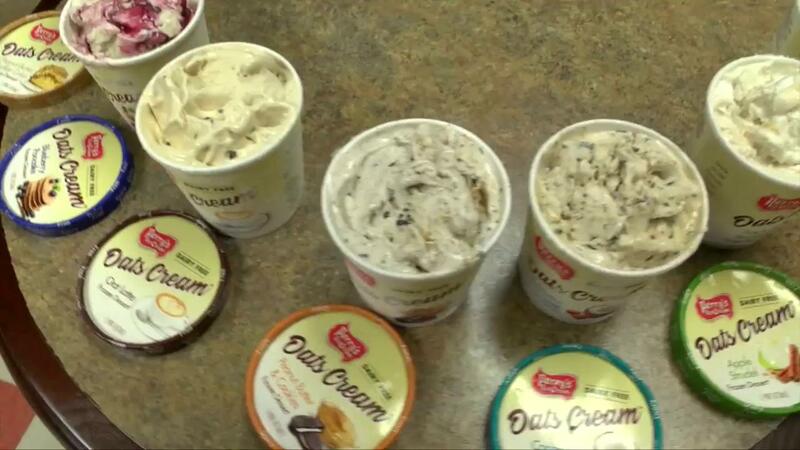 AKRON, N.Y. (WKBW) — Perry's Ice Cream has just launched a dessert that everyone can enjoy! The dairy-free, oat-milk based frozen dessert features seven flavors available in pints. Perry's Oats Cream comes in Apple Strudel, Blueberry Pancake, Coconut Caramel, Oat Latte, Peanut Butter Coffee Cake, Peanut Butter & Cookies and Snickerdoodle. "We talked with our vegan consumers, they are looking for good options-- they miss having ice cream," Marissa Wilson, Communications Manager for Perry's said. "Other consumers might have a lactose intolerance or preference to a plant-based life style and this product is suitable for all of those." The company partnered with Elmhurst 1925 to provide the "milked oats" used to produce the frozen snack. Elmhurst is based in Elma, New York, allowing Perry's to continue utilizing local vendors for its products. "The difference between oat based verses some of the other like almond or a soy," Wilson said. "You are getting more of a creamy product that tastes just like ice cream." Perry's Oats Cream pints can be found at Wegmans, Tops and Lexington Co-Op Markets. You can also get them at ShopPerrys.com and Amazon. Wilson says the company hopes to expand the line with additional flavors and even holiday flavors for the future.